Hand Of Glory records asked twelve artists for an original Christmas song. 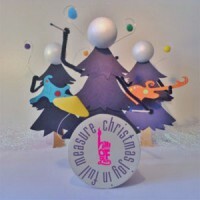 Here are twelve tracks that sum up the many experiences of Christmas, from lush widescreen pop (Webb Brothers), to sparkly Saturnalian disco (Mary Epworth) to dystopian Fall-esque horror (Extradition Order). Other standout tracks include Young Knives’ dark medieval-esque ‘Low Carol’, Kiran Leonard’s sprawling proggy epic ‘Huygens probe’ and Papernut Cambridge’s charming and magical ‘93 Million And One’. The Webb Brothers - Are You Coming Home For Christmas?